Gender gaps in representation at senior levels in the workforce are widespread, especially in academia. One possible explanation is that women just find it harder to say “no” when asked to do extra ‘stuff’ that detracts from research and is undervalued at the time of promotion. Indeed, women tend to perform more service than male faculty. Studies show that women also on average spend more time on teaching-related activities and advising students, while men spend more time on research. A clever experiment reveals that women are twice as likely as men to volunteer for tasks that are deemed by all as undesirable yet benefit of the group as a whole (service and advising are commonly thought of in academia as examples of these so-called ‘non-promotable’ tasks). It is true that a typical academic derives little to no pleasure from administrative work or from interacting with students. In fact, at many research-oriented institutions putting effort into teaching is discouraged. Once, when I was a graduate student, I had the misfortune to admit to an influential faculty member that I “wanted to teach.” He looked at me with great disappointment and asked: "Why don’t you want to do any more research after your PhD?” I was mortified and tried to reassure him that I still really wanted to do research and was committed to my work, but it was over – needless to say, we didn't end up collaborating after that interaction. Since then, I have been extremely cautious not to state my true preferences to anyone who I wanted to take me seriously for my work. But just about a year ago, unbeknownst to even myself, I somehow started down a path toward not caring about fitting into the “serious” norm. In a brilliantly insightful episode, Daniel Tiger (one of my son’s favorite cartoons) sings about how “you can be more than one thing.” So, over the course of last year I not only said “yes” to a variety of non-promotable "things", I actively sought out these “things” simply because they make me happy. I enjoy writing, so I started this blog (I don’t post often, but it’s enough for me). I applied for and accepted a high-workload administrative position that requires skills that I feel I under-utilize in my other more academic roles. I embarked on a long journey of reducing stuff I purchase and hoard (by joining Rent the Runway and Poshmark – worth a separate blog post coming soon). Probably the most poignant example though is one that follows up on my very first blog post. One day I decided to stop whining about not having time to start my own Taekwon-Do school, and to make it happen in the time I actually do have. 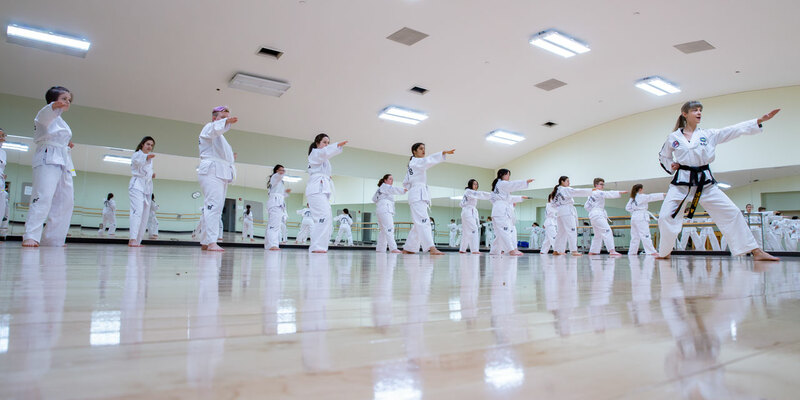 I talked to the PERA department administrators and set in motion a series of steps that led to the creation of a Taekwon-Do PE class at Wellesley. I am proud to say that I am the first ever tenured faculty member of an academic department who is also a PE instructor here. My first semester teaching Taekwon-Do in the spring was a great learning opportunity for me, more rewarding and challenging than I could have ever imagined. Testing students for yellow stripe, alongside my own instructor, was one of the proudest moments of my life. I am excited to continue the journey with several of them who are returning to take my Taekwon-Do class again with me in the fall. Taking these risks paid off, but you have to be careful when you say “yes” though, because it requires you to say “no” too (trade-offs and all). For each “yes” in my list above, there was a “no.” For me, among the “no’s,” the most notable was stopping my gym membership. The gym membership was completely financially irrational anyway, because I fell into the old behavioral trap of paying not to go. And despite quitting the gym, I actually got a lot more fit by teaching Taekwon-Do, because I had a much better commitment device! My students were relying on me to show up 2-3 times a week to teach, but there was no one at the gym to “guilt me” into going, just the “invisible” and therefore painless cost of gym membership coming out of my bank account. Despite (or perhaps as a result) of my “yes’s” and “no’s” over the course of last year, my research productivity somehow miraculously skyrocketed. I think I got better at trusting my co-authors, letting go of the little things, and became overall more efficient. The takeaway… We all need to learn how to say ‘no’ to the wrong things, and ‘yes’ to the right things in life. But ‘right’ and ‘wrong’ should not be defined by anyone else (not others in your field, not your parents, not your friends). Only you know what to prioritize to be happy and how.